I love to cook! But sometimes I just don’t have time to get to the grocery store and get what I need. Sometimes, I run out of ideas. Sometimes, I’ve been on Pinterest and have all the ideas in the world, but getting all the ingredients can get a little expensive. Enter in Home Chef to make your life a little more easier. Home Chef delivers everything you need to prepare a meal in 45 minutes or less right to your doorstep. Signing up for the service is pretty simple. Just complete a brief survey out on homechef.com and select all of your dietery restrictions and meal preferences. Based on your answers, Home Chef will select the right meal for you. But don’t worry, if you are not pleased with their selection, you can switch it out for something else. Your special delivery includes the freshest ingredients packed in a insulated recyclable box. Pick from several delicious meal options, delivered when you choose, with no contracts. 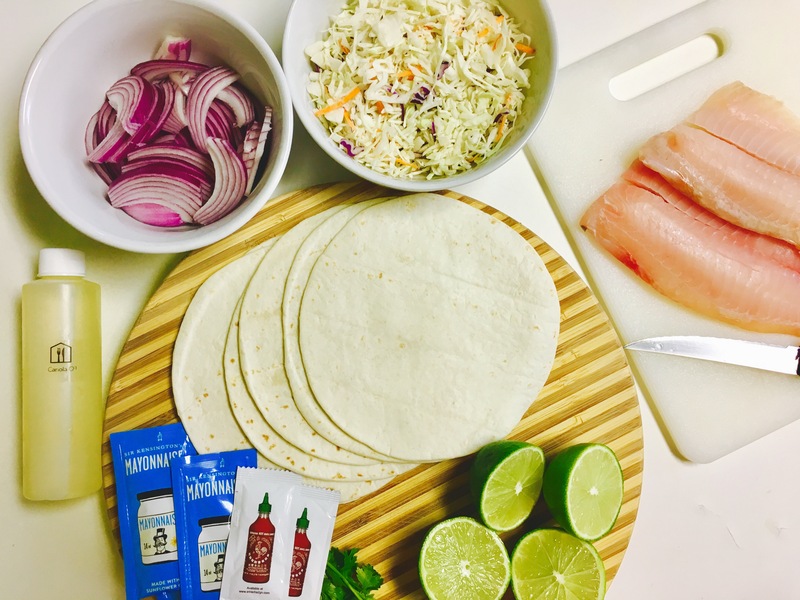 Today I’m making Baja Fish Tacos with Pickle Onions and Sriracha Slaw. Everything I needed was in the box, with the exception of mixing bowls and salt & pepper. They even send the recipes with a handy binder to keep it and future Home Chef recipes in. Along with the recipes are step by step instructions, with pictures and an explanation of all culinary terminology you may come across. I just love how detailed the Home Chef box was. It was simple enough for my 9 year old to understand. She actually did most of the prep work for it. So like I said, we’re making Baja Taco!! And boy we’re they delicious! The fish had a light batter just enough to make nice crisp on it. It was topped with lovely Sriracha slaw and pickled onion. I enjoyed everything about these tacos. All of the ingredients were really fresh, which made the tacos even better. The recipe included instructions for before and while you cook as well as notes from the chef, to makeyour meal preparation experience enjoyable. My daughter enjoyed the “Did you know” section. There, we were entertained with a little culinary history. Just a side note, Home Chef is perfect to incorporate in a lesson plan, if you homeschool your child. One other feature I loved about the Home Chef recipe is that it gave all the nutritional numbers right on the card. No need for guessing how many calories or fat your intaking. It’s all noted on the recipe card. Overall I loved my Home Chef Meal. I definitely would recommend Home Chef to anyone eager to get in the kitchen but doesn’t necessarily have a lot of time. It’s also great perfect for anyone learning to cook or those who want to amp their cooking game up a few notches. I personally loved that the simplicity of the recipes made it easy to share the experience with my daughter. So there you have it tons pros! Get started with your Home Chef experience today! $30 OFF YOUR FIRST MEAL!